Ravadinovo fairytale castle - a medieval style building right off of the main road to Sozopol at Ravadinovo attracts the attention of all travelers. The castle is named "In Love with the Wind" - as it is erected at a place that collects all the breezes and thus provides a place to catch a breath of cool air even in the most intense heat. 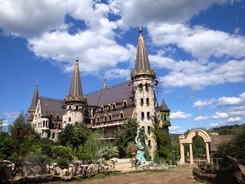 Last December, the castle was prized with the special award of the Bulgarian Hotel and Restaurant Association for the fastest growing tourist attraction site in 2012. This unique wonderland is built from thousands of tons of stone from the Strandja mountain, which is unique due to its changes in colour depending on the light and during the night time it becomes transparent. All windows will have a multi-colored stained glasses. Here time flows differently. The place is surrounded by quiet fairytale-like music. The ivy, planted at the ceremony of the first dig in 1997, has already covered the high walls. The park is not like the manicured French gardens, but is rather a fascinating place full of life and bird songs, with many flowers, shrubs and trees, fountains, statues, mermaids, and strange animals made from stone. The castle is also housing the "House of Tales", or rather what was left of it, from the Central Park of Sofia. A Local carver voluntarily agreed to recover it. The castle is opened every day from Monday - Sunday: 8:30 am - 10:00 pm.